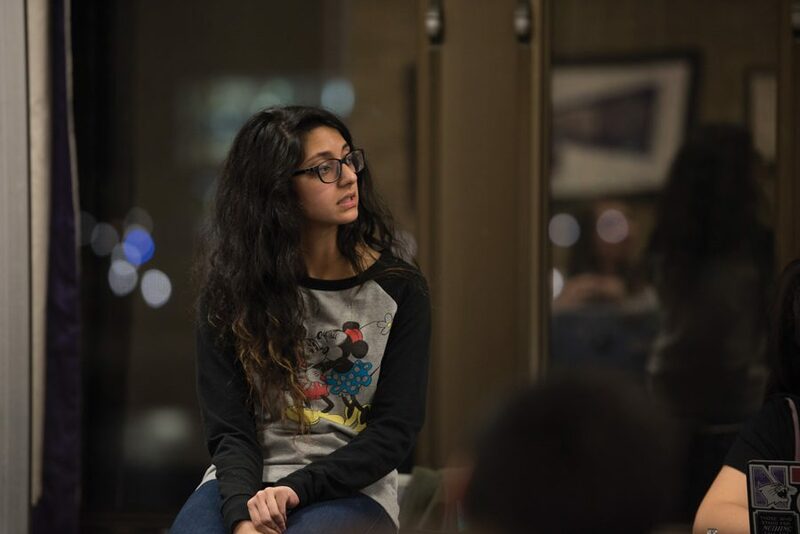 ASG President Nehaarika Mulukutla speaks during Senate on Wednesday. ASG passed the Student Group CARE Training Mandate, which requires sexual assault training for ASG-funded groups. Associated Student Government senators passed a code change Wednesday to mandate sexual assault, misconduct and harassment training for ASG-funded student groups. The change, introduced last week, requires the president and one other executive board member from each group to attend a training conducted by the Center for Awareness, Response and Education. The A- and B-status finance committees will withhold funding from groups that fail to fulfill the training requirement, according to the Student Group CARE Training Mandate. Julia Shenkman, a Multicultural Greek Council senator, told The Daily after the meeting the mandate is an important step in the right direction. Despite struggling to keep quorum, senators also passed guideline changes for the A- and B-status finance committees to reflect the new mandate. Communication sophomore Leo Scheck proposed an amendment — which ultimately failed to pass — to the training’s attendance requirement. Scheck said ASG should require the president, wellness chair or another executive board member to undergo training. The amendment would also have allowed one general member with solid attendance to fill in if an executive board member could not attend. Shenkman, one of the amendment’s co-sponsors, told The Daily the amendment would have encouraged groups to add a wellness chair to their executive boards. The Weinberg junior said wellness chairs are the best people to pass on information about sexual assault and misconduct. After more than two hours of debate, senators voted down the amendment 15-11. During the debate, ASG President Nehaarika Mulukutla said CARE recommended that student group presidents attend the training. But senators who co-sponsored the amendment raised concerns that student group presidents might not necessarily care about the issue. Because ASG has never before implemented similar legislation, Mulukutla said the group is open to future amendments or possibly expanding the policy to groups not sponsored by ASG. “Expand this program and hopefully one day, it will impact every single student on this campus, touch every corner of a Wildcat experience,” she said. Later in the meeting, senators tabled debate about a sustainability code change that would rescind publicity funding for groups that use ground flyers. They also tabled the vote on A-status and B-status guideline sustainability changes.